Studio Name: Wippell, (J.) & Co., Ltd.
Brief Description of Subject: Gothic arched windows with two lancets, each with an eight-pointed medallion above and below, and a round medallion above all. Right window depicts Jesus, age 12, in the Temple, astounding the doctors with his wisdom. Our Lady and St. Joseph can be seen in the background, just coming in. Medallion above depicts a lit lamp, symbol of knowledge. Medallion below shows the tables of the Ten Commandments. 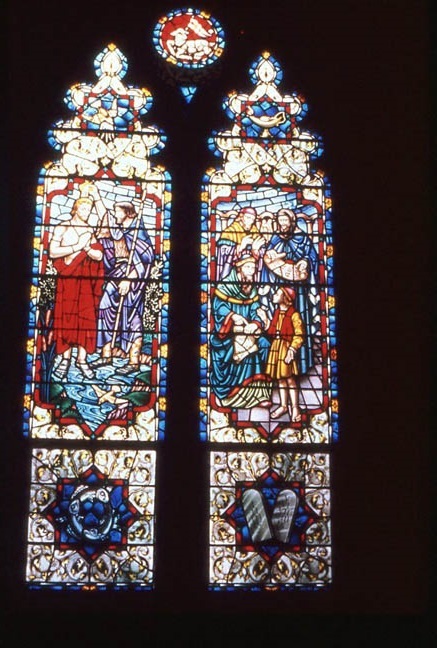 Left window shows St. John the Baptist baptizing Our Lord in the River Jordan, with a shell. Medallion above depicts Holy Spirit in form of Dove descending. Bottom medallion shows three fish swimming in a circle, symbolizing the Most Holy Trinity. Medallion at top of window shows Lamb of God, lying down, holding banner. Made by J. Wippell and Co., of London, England. All church windows installed by Bela Britok, of Detroit, MI.